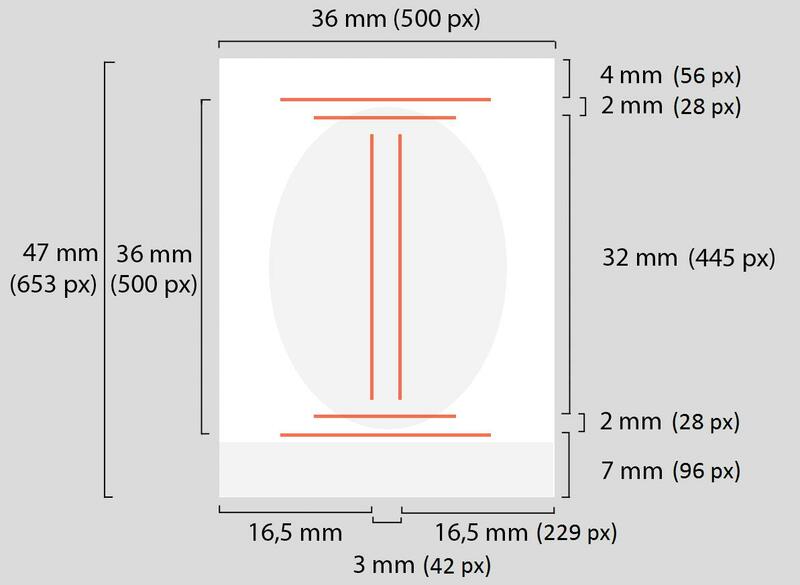 The photo size must be 36 mm x 47mm. 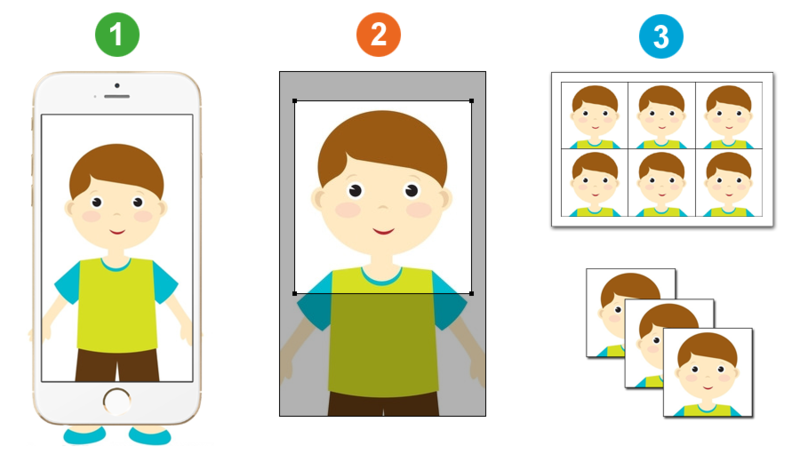 The dimensions of an electronically delivered photograph must be precisely 500 x 653 pixels. Deviations of even a single pixel are not accepted. The photograph can be black and white or colour. An electronically delivered photograph must be saved in JPEG format (not JPEG2000); the file extension can be either .jpg or .jpeg. The maximum allowed file size of an electronically delivered photograph is 250 kilobytes. The photograph must not have JPEG artefacts caused by over-compression (compression artefacts, Figure 3). The photograph may be no more than six months old. The photograph may not be edited in such a manner that even the tiniest detail of the subject's appearance changes, or in such a manner that the edits could raise suspicions about the photograph's authenticity that would affect the use of the document. Digital makeup is not allowed. 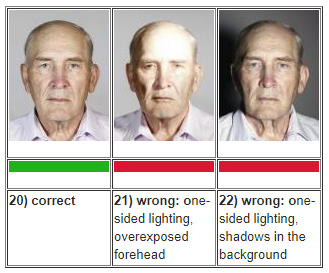 The photograph must be sharp and in focus over the entire facial area; it must not be blurry or grainy. This issue covers many different types of errors. The photograph's contrast may be so high that details are lost. 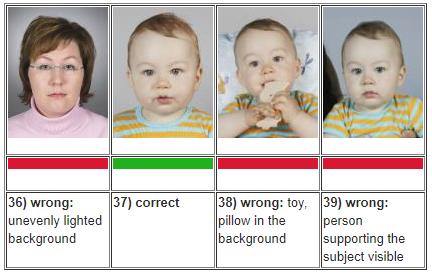 The photograph must not contain colour errors (Figure 7). For example, on the passport's information page the photograph is laser engraved as a greyscale picture, but it is saved on the chip in colour if the original photograph is in colour. Because their effective focal length is too short, in most cases mobile phone and tablet cameras cannot be used to take photographs that meet the requirements. 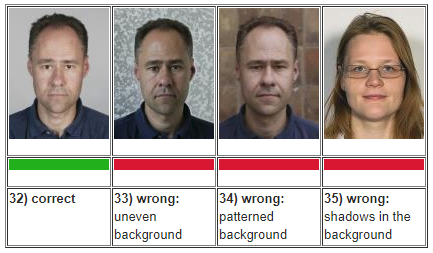 When the focal length is too short, the nose and other central facial features will look too large in relation to other facial features in the passport photograph. The best results can be achieved using a teleobjective with a 90–130 mm focal length equivalent to 35 mm, with the photograph taken from a sufficient distance. 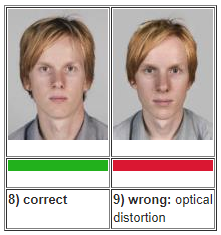 The starting point is that the subject's head is in the centre of the photo and that both the face and shoulders are facing straight towards the camera. The head must be straight. 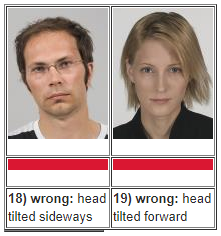 The head must not be tilted to the sides or forwards or backwards. The face and eyeline must be directly towards the camera. The photograph must be taken directly from the front. The photograph may not be taken from above, below or the side. These posture requirements may be deviated from due to medical reasons. In such a case, a photograph will be taken that best enables the recognition of the subject. 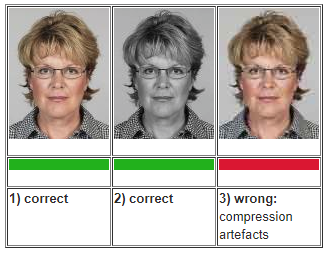 If the subject is unable to hold his or her head up straight, the correct positioning should be achieved by changing the position of the camera. Equal visibility of both ears in the photograph cannot be required, as one ear may be naturally further back, smaller or of a different size. The lighting must not cause the red-eye effect. The colour of the lighting must be natural, not bluish or reddish, for instance. The facial expression must be neutral. The subject's mouth must not be open. In the case of very young babies, some leeway may be allowed with respect to this rule, but even then, the mouth may only be a little open. The eyes must be open, and the subject must not squint. The eyes of even small children must not be closed. The entire face must be visible. For instance, accessories or hair must not cover the face. Particular attention must be paid to the eyes being visible. 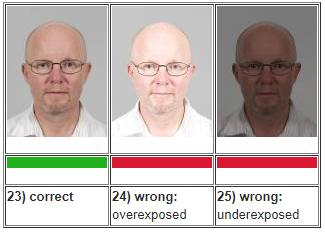 In model photograph 29, the frames of the eyeglasses partially cover the subject's eyes; in example 30 light reflections are doing this; and in example 31 this is done by the frames and a shadow caused by the hair. The safest bet is that no part of the frames is even close to the eyes. 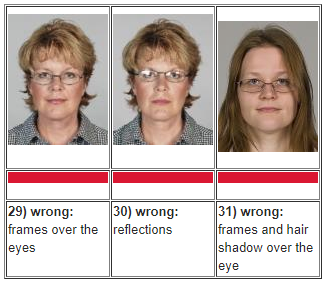 In addition, the frames must not be so thick that they make it more difficult to make out the facial features. Eyeglasses can always be taken off for the photograph. Dark glasses and eyepatches may only be worn for medical reasons. No head covering is permitted in the photo, unless it is for religious beliefs or medical reasons. 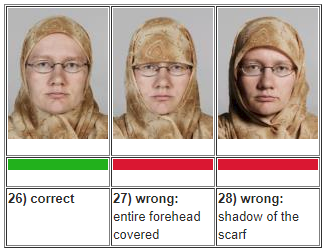 However, the head covering must not conceal or cast shadows on the face. The subject may wear a wig, if he or she wears this daily, for example due to medical reasons. The same rules apply to wigs as to genuine hair, i.e. they must not cover the face, particularly the eyes. 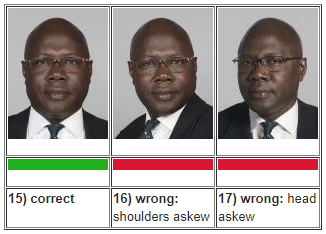 The subject of a passport photograph may wear makeup if this does not make it more difficult to identify the person. 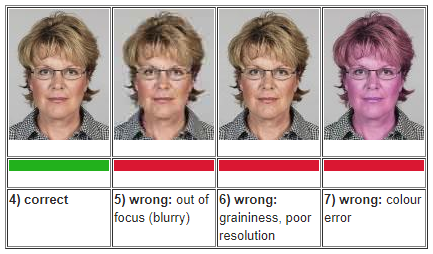 It is impossible to give comprehensive makeup rules; instead, the impact of the makeup must be assessed on a case-by-case basis. The background must be monochromatic and flat. The background colour must be light and neutral. No shadows may be visible in the background. The subject's face, hair and clothes must stand out clearly from the background. No other persons or items may be visible. A small child may be supported, but no part of the person may be visible in the photograph.